We organise activities to help people yield to the power of the Holy Spirit and activate His gifts for the service of others. 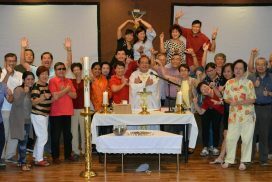 Weekly Charismatic session consists of praise and worship, followed by a talk, prayer for healing or Mass. We organise a “Life in the Spirit” seminar once a year. We meet every Monday, 8-10pm. Members also meet once a month in additional to weekly sessions.